When you think of best in class product managers, what companies come to mind? If we assume normal distribution of product manager quality levels, this question asks what distinguishes those who are 2.34 sigma over mean from those who are merely 1.285 over mean. That is some precision. And the answer that received 2500 votes lists a long list key traits. I do not know how one can measure many of them objectively. And this most popular and long answer not once mentions the word, “customer”. Other not so popular answers list customers and understanding customer needs. But none of the answers take it to next step – from understanding and serving customer needs to getting fair share of value created by serving those needs. Even my own survey (that used forced point allocation ) on product management skills, did not include aspects of customer value creation and value capture. If you think about it, all the traits listed in Quora (Design, Copywriting, …) or in my survey (Strategic thinking, Hustle, …) these are really secondary to the True North function of a product manager. Understand customer needs – Analytic skills, Usability analysis, etc. After all, what is a product but a value delivery vehicle? And all those great design, frictionless UI and copywriting do not make a product until you define a set of customers whose needs you meet and who want to pay you for fulfilling that need. Is that the product manager you have in mind? Maximally Valued Product – How to find customer value perception? The common definition of MVP is the Minimal Viable Product. The other MVP you should start thinking about – if you are serious about ringing the cash register – is Maximally Valued Product. All that validated learning is useless if you cannot find whether customers are willing to pay for the value your product creates or if you cannot ring the cash register. I introduced this new MVP in my last article. A Maximally Valued Product for a given customer segment is the product version that adds most value to the customers while enabling marketer to extract their share of the value as price premium. It is a very specific definition and it is customer centric. It does not leave the market wide open. It focuses on value created by filling a need (the need can be anywhere on this consumption spectrum). It closes with your share of the value created. After all charging for value created remains the simplest of all business models. Here is a very easy way to remember MVP – Your $499 iPad that did not include ear-phones! How can we find the different segments? How can we find their different value perceptions? How can we map that value to a price they are willing to pay? Who has access to these kinds of resources to do elaborate customer segmentation or complex analytics to find value and price perception. Especially startups. Here is a teaser on a lean startup’s method for answering these questions. You will have to wait for the next article on how to analyze the results from this method. Let me give you a very simple tool to answer two of these questions – segmentation and value perception. For finding pricing you can talk to me. Think of your customer’s value perception as a resource allocation problem. Say you give your customers 100 coins. You present them an assortment of benefits or a need fulfilled. Their job is to allocate those 100 coins such that they give more coins to the benefit they value more and vice versa. What are the key benefits do you want to measure vs. a long list of features? You find that from initial customer discovery. Of those what can you deliver through your product and do it better than competition? How do you account for non-interest? That is how do you weed out those that are simply not interested in any of these benefits but did the coin allocation simply because you asked them to. When you collect data from reasonably large sample (100-300) of target customers you will end up with a distribution of value perception. The data have the segmentation dimensions and the value perception of benefits. Let me tell you more on how to analyze this distribution to find segments and value perception in my next article. In the startup parlance MVP refers to Minimal Viable Product. 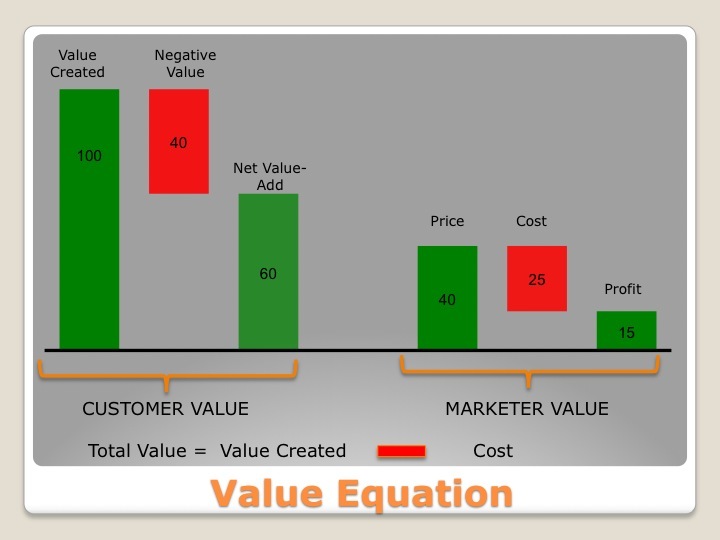 In this explanation there is no mention of which customers and what is customer value. It is inward focused definition. 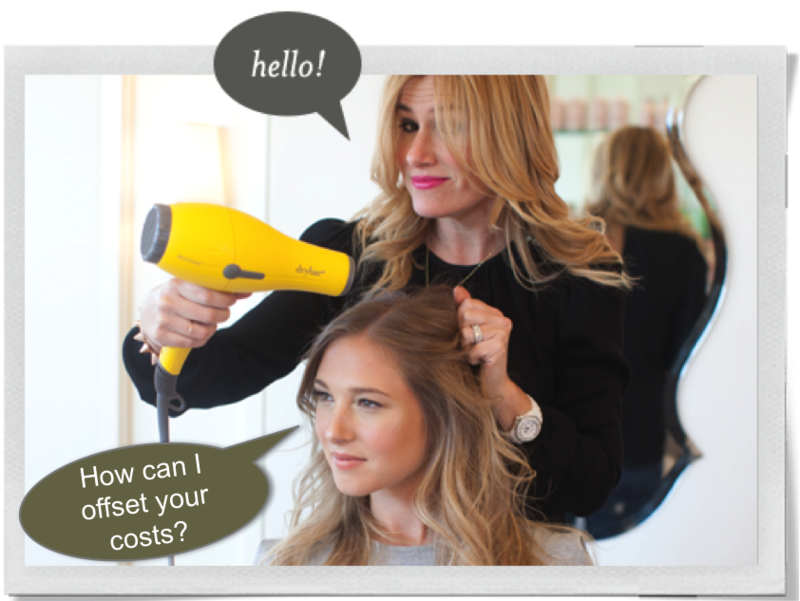 Since it does not talk about customers or value it does not talk about pricing. Some variations of the explanations have included pricing component to MVP. However measuring customer value or charging for the value delivered is not the primary concern in defining or building a Minimum Viable Product. I would like to take this concept and flip it on its head and show you what Apple builds. When Apple builds its products it is packed with only those features that are valued by its customers and it can charge for it. It may look the opposite when you consider the fact that they were the first to introduce all inclusive iMac and MacBooks. But had they thought they would not have been able to extract a price premium for those included features they would not have included them, I will come to that in a minute. Sure they could have built product versions that lacked some of those features and competed with other low-end products. As Steve Jobs would have said, “if we knew how to make it inexpensive without making the product crap, we would have done it”. Apple chose to go after those higher willingness to pay customers and added product features that extracted more value in the form of higher prices than the cost to add those features. 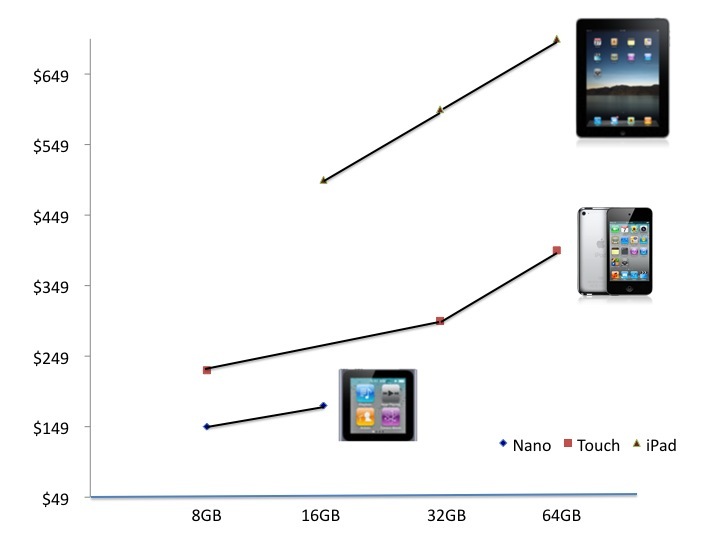 See below how they extracted value from flash drive capacity and 3G in iPad. Why the price difference is not the same? On the flip side see what they chose not to add. 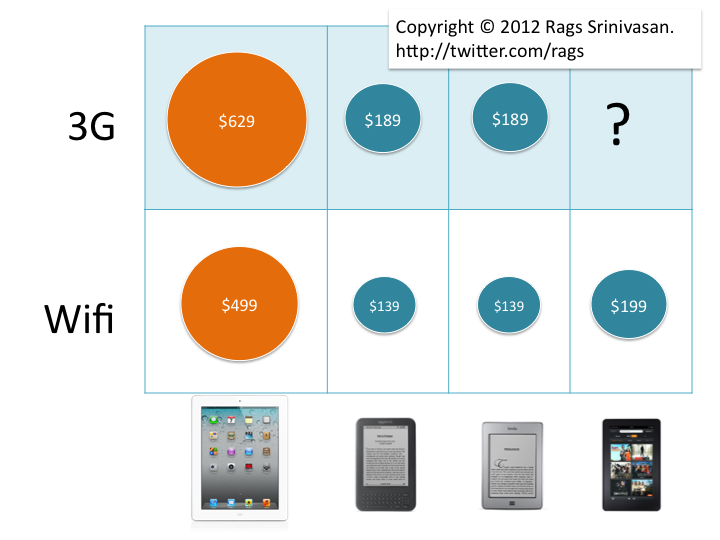 Even when you pay $829 for iPad you will not get ear-phones with it while you get them with measly $49 iPod. You can ask all you want for a Retina display MacBook Air but until they figure out a way to extract price premium for it you won’t see one. What Apple is doing is starting with the customer segment they want to target (they don’t have to get the iMac in billions homes) understand what these customers value and willing to pay a premium for, and deliver them just that at a premium price. Note the segment specificity, value creation and value capture aspects of the definition unlike the definition of Minimum Viable Product. The Maximally Valued Product packs features for sure but these are the features customers value and willing to pay for. It also lacks many features, sure customers may value them but if that does not flow into better prices, why bother? Which MVP do you build? While Fred Wilson makes a compelling case to get product-market fit correct, then define your strategy and then worry about making money, a VC who falls in the second category will argue, equally eloquently, strategy (making choices about segmentation and needs to serve) first, finding how you add and capture value (business model) is next and what the offering (product) is last. The two ways of reasoning are called Effectual and Causal reasoning respectively. Effectual – Instead of doing market research, competitive analysis, value analysis etc, go build something and keep iterating on it and building a growing customer base. Then worry about strategy and business model. Causal: Start with customer segmentations and their unmet needs (or jobs to be done). Make choices on the right segment you should target first and understand its value perception, alternatives and willingness to pay. Define a product version that serves that segment and offer at a price they are willing to pay. There exists a class of VCs who apply effectual reasoning and there exists another that applies causal reasoning. You can see Fred Wilson falls in the effectual bucket. So when you have two classes of entrepreneurs and two classes of VCs, the next obvious question is which pair would work together well. The aforementioned research suggests, cognitive similarity (“I like how you think”) was a decisive factor in how VCs decide choose to invest in startups. 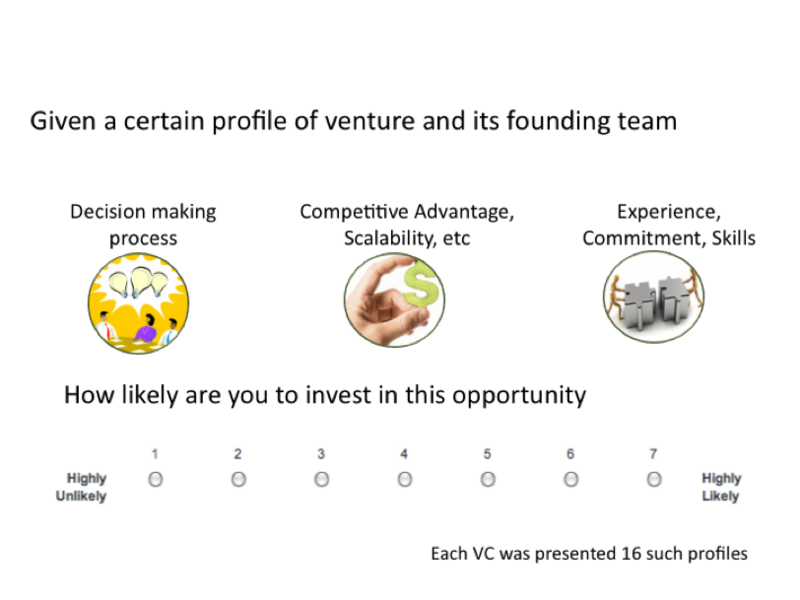 Their study was conducted on 49 partners from different VC firms, by presenting them 16 different hypothetical investment opportunities and asking them to rate how likely are they to fund these ventures. From these 784 data points, the researchers employed conjoint analysis to tease out the influence of individual factors on VC’s decision. This is approach is far better than stated preference studies that ask VCs for their rating and data mining studies that succumb to data errors. The number one deciding factor? How similar the thought process is between the VC and the founder. The researchers call this cognitive similarity, which has nothing to do race, national, education, gender or other physical characteristics. It is how a founder thinks and how similar it is to VC’s thought process. Higher the similarity, greater the chances of getting funding. Everything else, including the perception of the team, its experience and commitment (human capital) are influenced by VC’s reading of founder’s thought process. All other positive attributes we hear about, the product’s competitive advantage, scalability, founding team’s ability to hustle, their focus etc seem to be bestowed after the fact. What does this mean to you as a startup founder seeking venture funding? You are better off seeking those VCs who think like you do in terms of product, strategy and business model. If you think market demand and opportunity size first and pitch to Fred Wilson you are most likely going to come back empty. On the other hand you at least get to play if you think product-market fit first. So knowing how you reason and seeking as venture partners only those who think like yourself saves lots of wasted time and agony. Will Fred Wilson and other VCs admit to this influence of cognitive similarity in their investment decisions? More broadly, do VCs know and admit to the influence of cognitive similarity on their funding decisions? No, they do not recognize this hidden factor. And I expect comments from a few stating so. In the same study that teased out this hidden factor, the researchers asked an explicit question on how much weight VCs place on cognitive similarity with founders. VCs rated this as the the least important factor, but when they had to place a bet given a profile of venture and its founders, the hidden influence of cognitive similarity came out loud and clear. Finally, is Fred Wilson right? Is effectual better than causal? The proponent of this classification, Professor Saras Sarasvathy, goes one step beyond this mere classification. She argues great entrepreneurs are ‘effectual’. They opt for doing things vs. analyzing things. I do not subscribe to this latter part of her theory regarding what defines entrepreneurial greatness.